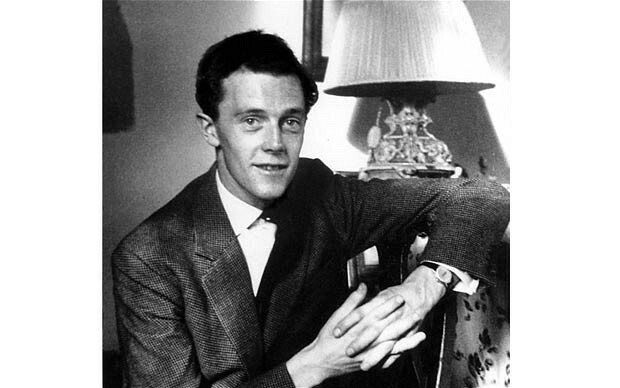 Colin Clark was pretty respected when he first released “The Prince, The Showgirl, and Me” in 1995. There were a few outlandish parts but overall it was considered pretty reliable. It was nice to get a third party perspective on Marilyn and Olivier’s working relationship. Clark’s family knew Olivier which is how he got the job. In both “My Week With Marilyn” and “The Prince, The Showgirl, and Me” Clark shares with us his diaries. The problem is that there was a 9 day period that Clark left blank in “The Prince, The Showgirl, and Me” (September 11-19, 1956). In 2000 Clark released “My Week With Marilyn” that described that blank period. In them he details his time spent with her while Arthur was away. He was even there when she miscarried! Except he wasn’t. It’s pretty well documented that Marilyn was quite taken with Arthur. While the journal incident (Marilyn found a journal entry where Arthur had written that Marilyn was a disappointment like his first wife Mary) had happened there is nothing to suggest that Marilyn ran into the arms of another man. Marilyn made sure that only her inner circle really knew what was happening in her life. In fact, when Marilyn was set to announce her divorce from Joe DiMaggio, she told Billy Wilder she was sick for the week of October 4, 1954 and announced her divorce on October 6. She was not someone who would let a random stranger into her life even when she felt betrayed by someone she loved. Marilyn was an extremely private person for fear that she would be betrayed. It’s also worth nothing that no one on the set knew of this “affair” which is also highly unlikely being everyone in her private circle was keeping tabs on her. This is the most damning evidence that Clark is not telling the truth. Marilyn reportedly found out she was pregnant in early September. 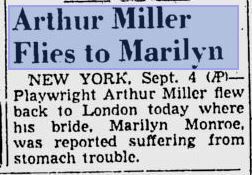 Arthur Miller returned to the States on August 27th being his daughter was sick. 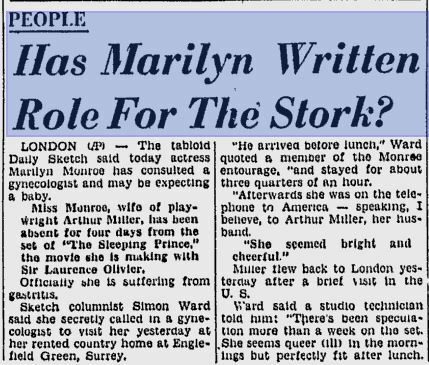 He was apparently told around September 3rd that Marilyn was pregnant and flew back the 4th or 5th (accounts vary but most agree he left on the 4th and arrived on the 5th). Marilyn then possibly had a miscarriage on the 8th of September although looking at her work schedule this looks to be false as well. 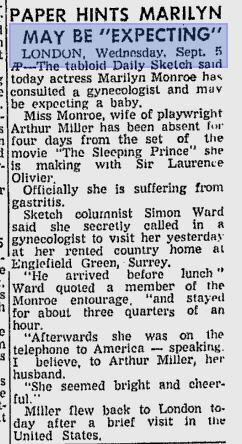 While the articles below suggest that Marilyn did meet with a gynecologist in late August/early September, she had no significant break from filming after September 7th. If she did have one, it would have been between August 31-September 7th. Marilyn spent nearly two weeks in the hospital with both miscarriages yet no hospital stay has been recorded with her trip to England. Huge thank you to Michelle Morgan for confirming this for me. If Marilyn had miscarried again 10 DAYS LATER or even 18 days later (again though, no medical records support this), it would have been like another period for her. It is highly unlikely Marilyn became pregnant again before Arthur leaving for Paris on the 13th. It also would have been impossible for her to know she had miscarried being the egg actually implants 23 days after the last period. Her body would have treated her possible miscarriage on the 8th as her last period. Overall Clark’s dramatic retelling of events is both comical, slanderous, and invasive. While no one can claim that Marilyn was a saint when it came to being faithful, she wasn’t going to have a serious flirtation 2 months after marrying Arthur. By all accounts, Marilyn was quite infatuated with Arthur and had been for a number of years. She tried desperately to make her marriage work as did Arthur. She wasn’t going to throw a wrench in her life so easily. Clark continues the idea that Marilyn was a drug addicted floozy who was always looking for love in the wrong places. She deserves more credit than that.